While the campaign in Flanders turned into a bloody struggle in which hundreds of thousands died for a few feet of shattered earth, the Allied Powers sought new fronts on which they might have more success. A series of major offensives in Ottoman-ruled Palestine began in the fall of 1916. After some early failures the Allies steadily moved forward, their advance culminating in the capture of Damascus in October 1918. 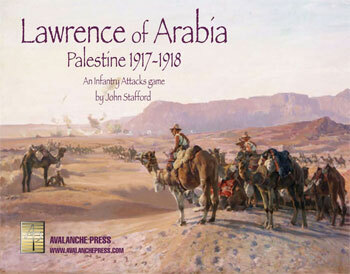 Lawrence of Arabia is a stand-alone game in the Infantry Attacks series, our World War One equivalent to the long-running Panzer Grenadier series. Units are companies and squadrons, and the sixty scenarios represent actions from the campaigns in the Sinai Peninsula and Palestine between 1915 and 1918, with the Ottoman Turkish army on one side supported by German and Austro-Hungarian detachments, and the British on the other supported by Australian, New Zealand, Jewish, Arab, Indian and West Indian forces. The pieces are the fantastic, tile-thick laser-cut type seen in Kursk: Burning Tigers and Korean War: Pusan Perimeter. They're just plain fun to handle, and have no scorching or soot like some laser-cut game pieces. These are the best wargame counters ever made. There are eight semi-rigid mapboards, the same type found in Panzer Grenadier games. They are fully compatible with the Panzer Grenadier boards — you can play scenarios from either series on mapboards from the other game system.